I first saw the recipe for this coffee cake on Rue a year ago. I have been wanting to make it since and Easter seemed like the perfect occasion. The original recipe called for blood oranges, but after calling and searching multiple grocery stores I found out they are out of season. Plan B. I went to whole Whole Foods thinking they would for sure have the glamorous blood oranges, but I struck out again. The man helping me asked if I had ever tried a cara cara orange. No sir, I have never even heard of those. He whips a knife out of his pocket (slightly terrifying) and cuts a little sliver of the cara cara for me (great customer service Whole Foods). He described them as a mix between a navel orange and a grapefruit. They were tart and juicy, and were slightly bolder than a regular orange. I threw four in a bag and headed home to start baking. The combination of the citrus from the oranges and the richness of the olive oil made this cake full of flavor and kept it super moist. I made the cake on Saturday so we could enjoy it as an afternoon snack, after dinner dessert and for breakfast Sunday morning. This is clearly a versatile dessert. Preheat the oven to 350 degrees. Coat the inside of a round tube or bunt cake pan with non-stick cooking spray. In your mixer, combine the sugar and eggs and light and foamy. 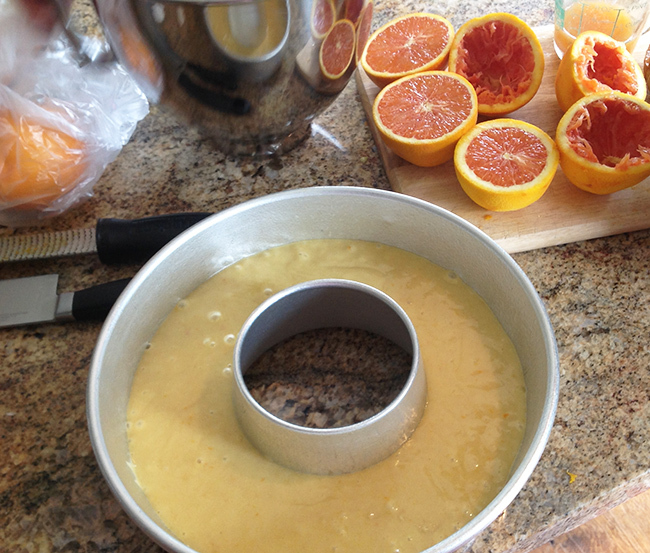 Add 1/2 cup of the orange juice, half of the orange zest and the olive oil. Mix until combined. Slowy mx in half of the flour mixture, followed by the milk then finish with the other half of the flour mixture. Pour the mixture into your prepared pan and bake for 30-40 until a toothpick comes out clean and it is slightly brown. Let the cake cool for 15 minutes. In the meantime combine the remaining 1/4 cup orange juice and 1/4 cup powdered sugar in a small bowl. 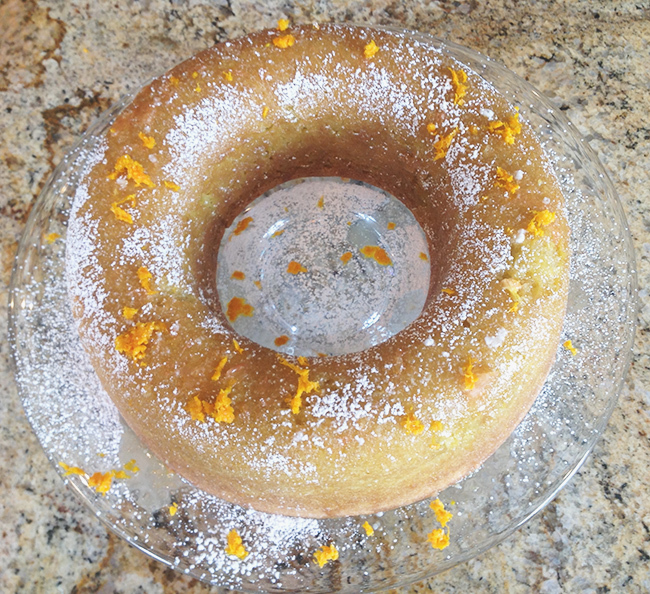 Drizzle the glaze over the cake then serve with a sprinkle of orange zest and powdered sugar!